Katie Aselton, Lake Bell and Kate Bosworth star in a girls-only weekend getaway to a remote island from their childhood turns into a fight for survival in the heart-racing thriller directed by and starring Katie Aselton. Bonus materials include an audio commentary with director/actress Katie Aselton and actress Lake Bell. 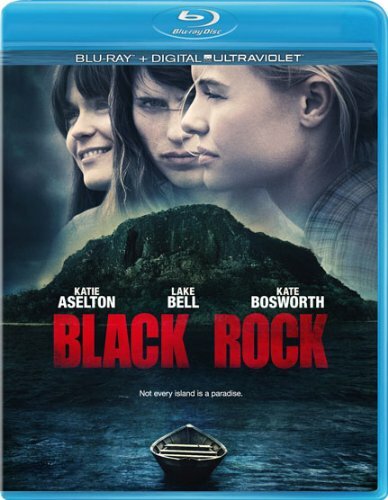 Katie Aselton, Lake Bell and Kate Bosworth star in Black Rock Arriving On Blu-Ray, DVD and Digital Download July 30 From Lionsgate Home Entertainment. A girls-only weekend getaway to a remote island from their childhood turns into a fight for survival in the heart-racing thriller, Black Rock , arriving on Blu-ray Disc (plus Digital UltraViolet), DVD (plus Digital UltraViolet) and Digital Download July 30 from Lionsgate Home Entertainment. Directed by and starring Katie Aselton (TV's "The League," The Puffy Chair), the indie thriller also stars Lake Bell (No Strings Attached, It's Complicated, What Happens In Vegas) and Kate Bosworth (Superman Returns, Straw Dogs, Blue Crush). Three childhood friends, Sarah (Bosworth), Abby (Aselton) and Lou (Bell), get together for a private campout at an iconic setting from their childhood, an empty island off the coast of Maine, to renew their bond of sisterhood. The trio, however, quickly finds themselves in a fight for their lives. After meeting three men who have come to the island for a hunting trip, a night of drinking spirals into a tragic accident, and the ladies soon become the target. What first started as a simple play date to recall old times is now a race for survival. The Blu-ray and DVD bonus materials include an audio commentary with director/actress Katie Aselton and actress Lake Bell plus a look at the movie's thrilling score and a "making of" featurette. An Official Selection at the Sundance Film Festival, Black Rock will be available on Blu-ray Disc and DVD for the suggested retail price of $24.95 and $19.99, respectively. Title Copyright: Black Rock (c) 2012 Black Rock the Movie LLC. All Rights Reserved. Artwork & Supplementary Materials (c) 2013 Lions Gate Entertainment Inc. All Rights Reserved.